The Exumas, looking south from Hawksbill Cay. 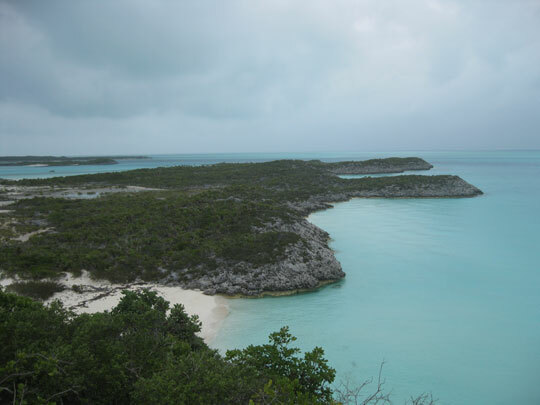 Like Eleuthera, the word Exuma sounds exotic and mysterious, but in a slightly different way. Exuma sounds more like a voodoo priestess. Or that eccentric Aunt who lives tucked away in the middle of nowhere brewing odd potions and elixirs and speaking with an accent that makes her sound like she is intoning in an ancient tribal language. And, unlike Eleuthera, the Exumas do not feel safe and reassuring. Eleutheraâ€™s mighty cliff dotted with houses felt comforting as it watched over us while we dodged crab pots and sailed down its western coast. As we looked to the east we knew every port was alive with villages, smiles and small mysteries. The Exumas are a mostly uninhabited island chain stretching for 140 miles, bounded by the deep waters of Exuma Sound on the eastern side and by the much shallower waters of the Exuma Banks on the western side. 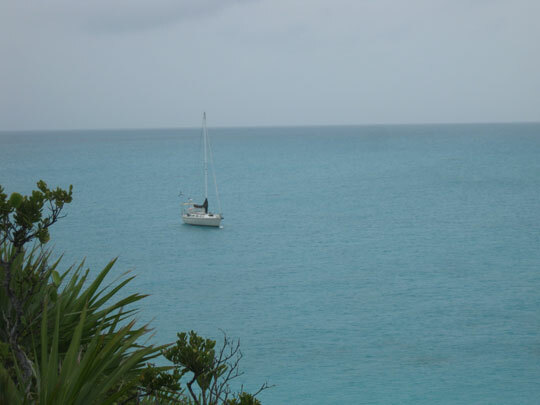 We sail the western side of the Exumas, departing each island by sailing far into the west until the island behind is just a blurry grey mark at the bottom of the sky, then southeasterly around shallow water and sand banks until the waters to the east deepen again allowing us to head back towards land and our next destination. Blue Wing moored off of Hawksbill Cay. What we have seen so far of the islands is mostly rocky, covered with low-lying scraggly plants. It is beautiful, yet harsh. You need to watch your step as you explore ashore, as one wrong one will throw you off balance down a craggy rock face or brush you up against a poisonous plant or find you in the path of a snake. A climb to a high point in one of these islands gives you a breathtaking view. Land and water stretch out towards the horizon in marvelously exotic shapes of turquoise blue seas and green vegetation under wide-open skies. Mystery as far as the eye can see. Hi Duwan. Glad to see you exploring the world. Beautiful photos! Have fun.